Note: This ARC was provided by the authors via Enticing Journey Book Promotions in exchange for an honest review. 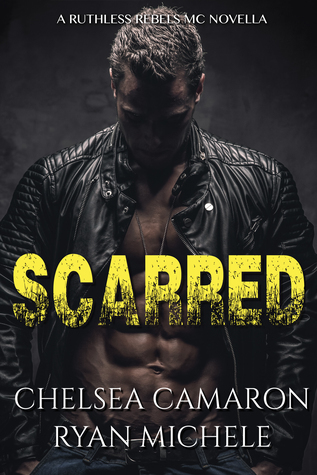 Scarred is the third and latest addition to the Ruthless Rebels series of stories brought to romance readers by the writing team of Chelsea Camaron and Ryan Michele. This is also the third novella that carries with it a second chance love story theme, but again, the circumstances that surround the couple here are different from those that came before them. At eight years old, Whitton Thorne and Roelyn Duprey were the best friends. They would fall in love, but on what was supposed to be the night that was a turning point point in their relationship, Whitton would up and leave Roe, choosing to be by his twin brother Waylon's side. It's been ten years, but circumstances have led Whitton and Waylon--now members of the Ruthless Rebels MC and known as Skinny and Triple Threat or TT--to make the journey from Alabama to their hometown of Blakely, Georgia. Those circumstances have put Roe directly in Whitton's radar, as well as those who seem to be after Whitton's club. He's created a new life for himself and has a family in Alabama, but he knows he can't leave Roe behind again. Will Roe give them a second chance together? Learn more about Chelsea Camaron and Ryan Michele. Purchase Scarred on Amazon | B&N | iBooks | Kobo.